What’s going on in the mountains. Plattekill and Belleayre Ski Mountains both host their monthly discount days: $15 for the first 100 people at the former, $25 all day at the latter. Can’t they spread this stuff out? Skinny Jim + The 9 Blacktops + Soul Reapin’ 3 + Earnest Hem-n-Haw all at Snapper McGee’s in Kingston. Hunter Mountain begins its 50th Anniversary Celebrations. Orville Slutzky was 41 years already when he and his brother Israel built the ski mountain for a consortium led by Jimmy Hammerstein (son of Oscar). When the consortium failed, the Slutzkys stepped in to take over the reins, pioneered snowmaking, and made Hunter what they proudly (if too frequently) celebrate as the “snowmaking capital of the world.” At 91 years of age, Orville still shows up for work at 4:30 every morning, 7 days a week. Read an excellent story on the mountain’s history here. And a hilarious quick Q&A with Slutzky, one of the last members of what Brokaw coined the Greatest Generation, here. Anyway, Hunter celebrates the start of its anniversary year après-ski with live music from Nuts in A Blender, DJs, and the opportunity to win a pair of tickets to see Motley Crue. Ouch. Out on Hunter’s Main Street, the Catskill Mountain Foundation hosts an Art Talk? with Gourd Artist Claudia Pflueger at 1:30pm? at Kaaterskill Fine Arts, Route 23A, 7950 Main Street, and at 2:30pm, the second of four weekly one hour Poetry Writing Workshops? with Carolyn Bennett at the Village Square Bookstore & Literary Arts Center right next door. Bennett stresses that “You needn’t have written poetry before this workshop series in order to attend,” nor do you need to attend each week. Uncle Rock and Ratboy Jr. play Kidtopia, January’s weekly “All-ages interactive live music show” for the under-10s, at the Utopia studios, 293 Tinker Street in Woodstock. $9 adults, $7 kids. 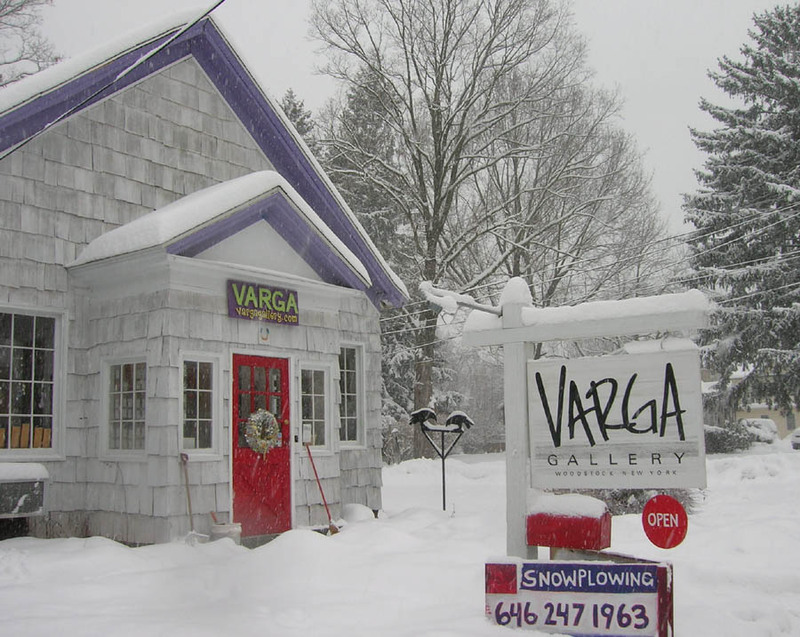 beyond… VARGA Gallery has been recognized for its exciting and innovative exhibitions over the past five years.” Indeed, VARGA had provided a much-needed, highly energetic youthful shot in the arm to the Woodstock arts community. 130 Tinker Street. Free. Still in Woodstock, for those who can afford the asking price, the Levon Helm Band performs its regular Saturday night Midnight Ramble in Levon’s home barn studio. Support comes from 77-year old blues guitarist Hubert Sumlin. You want movies? The Tinker Street Cinema in Woodstock has The Reader. The Mountain Cinema in Hunter is showing Catherine Hardwicke’s Twilight, and, somewhat optimistically, Madonna’s Filth and Wisdom. And the Inquiring Minds Bookstore/Muddy Cup Café in Saugerties, has, at 5pm, a special free screening of The Business of Being Born, a documentary about modern birthing in America. Also at the recently opened Inquiring Minds/Muddy Cup: Sup Pop artist Daniel Martin Moore. “He comes from a place both geographically and personally removed from any sense of the independent music scene,” says his Sub Pop bio. “Clearly, that’s okay.” Especially given the free admission. 7pm. Daniel Martin Moore. Sub Pop goes folk.